The BBC has taken it upon itself to promote the theme of shortages in hospitals in the Gaza Strip – with little or no context. An interview from November 18th with a WHO representative titled “Gaza medical supplies ‘running low’ – World Health Organisation” broadcast on BBC Television News. From the same date – an entire report, headlined Gaza crisis: ‘Every hospital ward is full‘ by Wyre Davies, also broadcast on BBC Television News. “We’ve been down to the main hospital in Gaza – Shifa Hospital – on many occasions. I was there a couple of days ago and every single ward was full and the emergency rooms were…every half hour or so they were bringing in the victims of Israeli air strikes ..erm.. and at the time they said they could cope but the problem of course is that the longer these attacks go on, the fewer supplies they have and of course if the attacks escalate into a full ground invasion there will be significantly more casualties. There have been 50, 52, Palestinian deaths in Gaza from the fighting over the last 4 or 5 days – half of these are civilians – but if there was to be a ground invasion, that will certainly increase. Like his colleague Jon Donnison, Davies does not make it clear to audiences that the information he is repeating – both in terms of situations in hospitals and casualty numbers and causation – is coming from Hamas sources. He also fails to mention the circumstances surrounding the closure of the Kerem Shalom crossing through which supplies enter the Gaza Strip. In reality, it is the very same Hamas which is providing information to Davies about shortages in hospitals which, together with its affiliates, is also firing rockets at the border crossing and repeatedly forcing its closure. Another related point which Davies fails to address completely is the fact that Palestinian patients from Gaza continue throughout the hostilities to enter Israel through the Erez Crossing for medical treatment. On November 19th, replacement parts for a CT scanner were transported into the Gaza Strip via Erez Crossing. On November 19th, fourteen Palestinians and their accompaniers travelled into Israel for medical care. On November 20th, 118 truck-loads of medical and other supplies were scheduled to enter the Gaza Strip via Kerem Shalom, but the crossing had to be closed due to rocket fire. The problem of shortages in hospitals in the Gaza Strip did not, however begin with the current round of hostilities. The lack of communication and coordination between the Palestinian Authority in Gaza and Gaza’s Hamas rulers has for significant time been affecting both supplies to Gaza hospitals and the ability of patients to travel for medical treatment elsewhere. The restricted medical supplies in Gaza are marked by a shortage of 400-500 varieties of medical equipment (out of a defined 700), including a shortage of surgical and anesthetic equipment. There is an average shortage of 33% of desired types of drugs at any given time. Medical suppliers are often reluctant to sell supplies to Gaza since there are issues with nonpayment. All the requests for medical supplies (equipment and medicine) submitted by the international community to the Gaza CLA [The Coordination and Liaison Administration to Gaza] have been approved for entry into Gaza. On average medical supply requests (medicines and light equipment) are approved within a span of 24-72 hours. Coordination of approved medical supplies is completed within one working day after the organization submits the intended day of import. Since September 2012, international organizations, in coordination with the Gaza CLA, have imported 32 trucks of drugs and medical supplies through Kerem Shalom Crossing. This has included spare parts for dialysis machines, helium for MRI machines, and three fully ambulances. An additional five loads of medicine were imported into Gaza through the Erez Crossing through special coordination. Gaza hospitals are reported to be at 80% capacity, only slightly higher than intake then during routine periods. On November 17th the Coordinator of Government Activities in the Territories updated Hassin el Alshich [Gaza Health Ministry] that, despite the problematic security situation and the ongoing rocket fire, it would be possible to transfer medical supplies into Gaza. It is misleading – as well as inaccurate – when the BBC chooses to present to its viewers with a one-dimensional picture of the situation in Gaza hospitals as though all their problems were directly attributable to Israel’s actions when that is clearly not the case – either from the point of view of Hamas’ prevention of supplies arriving by rocket fire on the crossings or from the wider view of Hamas’ role in initiating the conflict. Here is footage taken on the same day as the FPA statement was issued and titled by the BBC itself “Israel-Gaza conflict: BBC presenter under rocket fire”. Apart from the fact that the BBC’s Health & Safety department might want to improve risk assessments by instructing reporters to familiarize themselves with the protocols of behaviour in the event of rocket attacks (clue: standing outside in an open space and talking is not one of them), it is remarkable that neither the BBC nor the FPA apparently feels the need to issue a statement on the deliberate targeting of civilians (which, as we now know, includes journalists) by Hamas. After all, that does contravene the Protocol on the Protection of Victims of International Armed Conflicts. 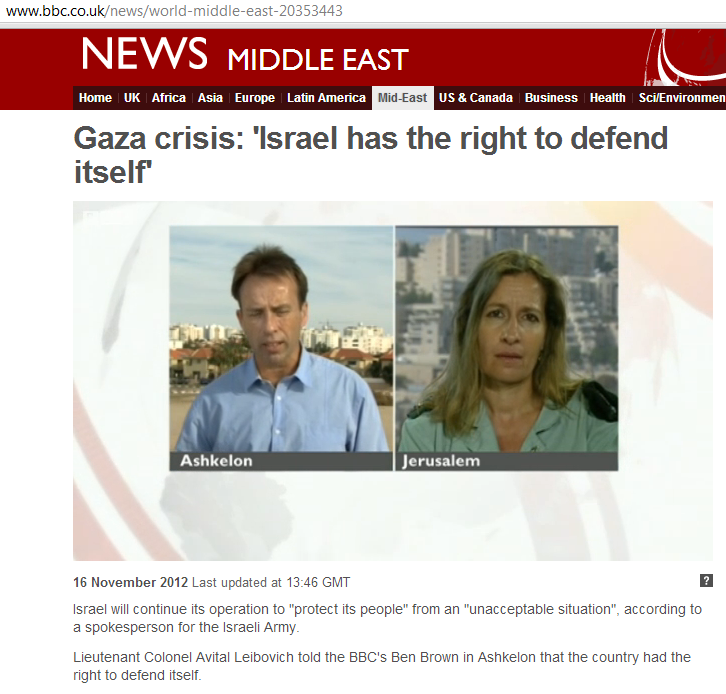 Here is the BBC’s Ben Brown – located in Ashkelon – interviewing the IDF’s Foreign Media Spokesperson Lt Col Avital Leibovich on November 16th 2012 for BBC television news. As was the case when Brown interviewed another IDF officer the previous day in Kiryat Malachi, he seems remarkably disinterested in reporting what is going on in the places in which he is located, constantly shifting the conversation to events in the Gaza Strip. Note that Brown makes no mention of those people killed in Israel, despite having been present at the scene only the day before. The BBC may have reporters currently in both Israel and the Gaza Strip, but that – as can be seen by this example – does not guarantee balanced coverage of the events in both places. 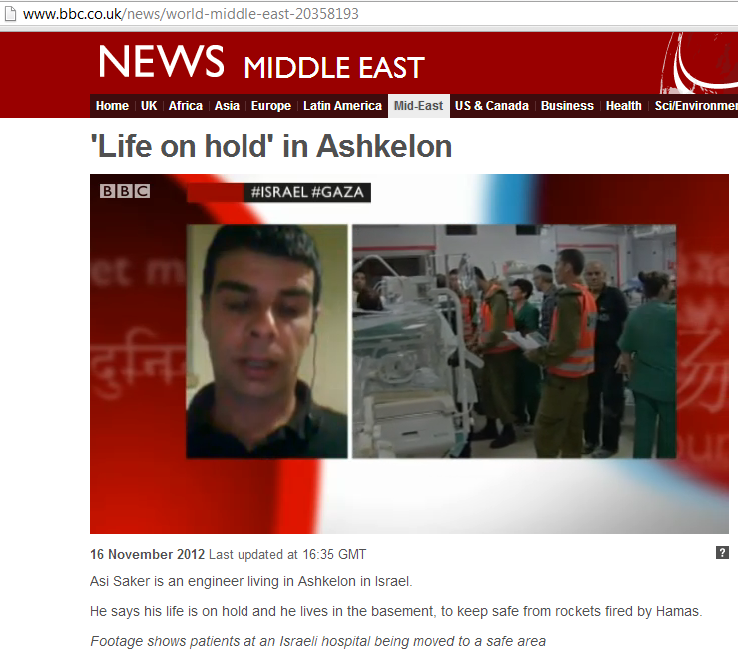 However, one BBC News programme managed to find an Ashkelon resident to interview via Skype. The presenter seemed to be no less interested in expressing his own views than in hearing his interviewee’s experiences of life under rocket fire. Speaking of BBC reporters currently on the ground in Israel, readers may be interested to know that Katya Adler is back. Probably few will have forgotten some of her previous work. 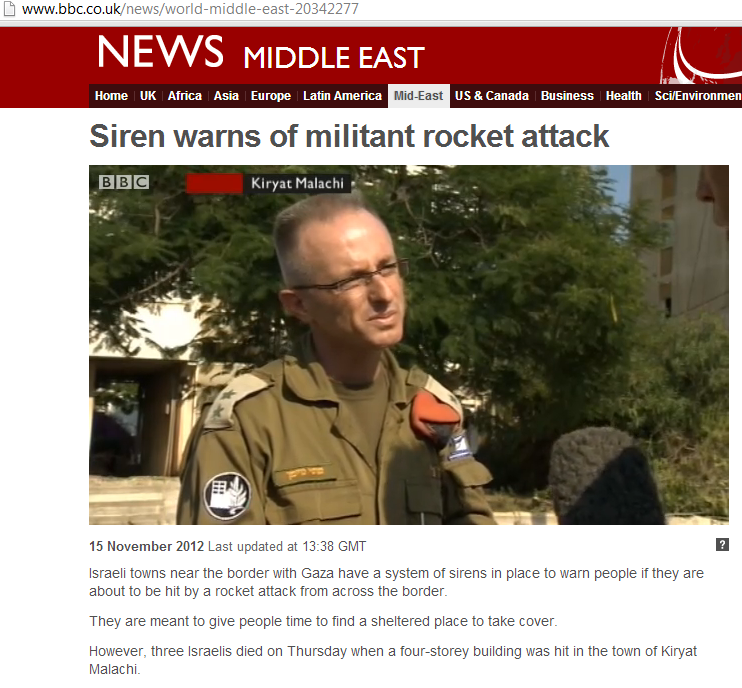 On November 15th the BBC finally ventured out and made its way to the region of Israel under rocket fire. In this interview, which appears to have been broadcast on television news, the BBC’s Ben Brown interviews an officer from the Home Front Command about the tragic incident in which three people were killed in Kiryat Malachi by a direct missile hit on an apartment block. There’s ‘BBC reporting from Israel’ for you. But Ben Brown wasn’t the only BBC journalist in Kiryat Malachi that day. Yolande Knell of the BBC Jerusalem Bureau was also there, although BBC Radio 4 did appear to think she was somewhere else as its ‘Today’ programme presenter described her as being “on the Israeli – Gaza border” – which is in fact some 33 kilometers away from Kiryat Malachi. But that report from Israel – which can be listened to here – did not shed much light on what it is like for Israeli civilians under rocket fire either. In fact it rapidly turned into yet another BBC story about a BBC journalist: a report on Yolande Knell under incoming rocket fire. During part of Operation Cast Lead in 2009 I happened to be in the UK and of course followed the news on the BBC closely. I often remarked then that any BBC viewer who is not familiar with Israel must believe that only politicians, government spokesmen and army personnel live there – because I never saw an ordinary Israeli citizen interviewed by the BBC. Old habits seem to die hard: two BBC reports from a town in which three people were killed only hours earlier and not one ordinary Israeli voice is given air-time.